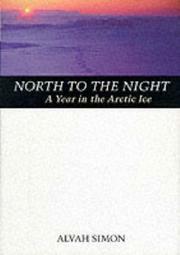 Icy adventure, dramatically recounted, about wintering over in a 36-foot sailboat frozen into place north of the Arctic Circle. It may or may not be coincidence that the most popular explorer/adventure books in recent years have taken place at high altitude (Everest) or low latitude (Alaska). A long-time adventure sailor, Simon is a veteran of expeditions in the Southern Hemisphere, including treks into Borneo. But it was the romance of the Arctic that called him for what was to be his and his wife Diana’s last major exploration. It took them nearly two years to prepare, including finding the 36-foot steel boat that was to be their home and anchoring for a winter in Maine to practice cold-weather survival. Come spring, they set out for Baffin Bay in search of a cove sufficiently protected to keep their mission from being suicidal, and sufficiently remote to satisfy Alvah’s hunger for quest. They barely made safe harbor before the ice began to close in. Soon after, Diana was flown out to New Zealand to be with her terminally ill father. With emergency service shut down for the winter and 24 hours of darkness setting in, Alvah was isolated with their cat, Halifax. His months alone evolved into a spiritual search that changed his life. He also endured extraordinary mechanical challenges that included temporary blindness from carbon monoxide. So transformed was he by his months alone in darkness and cold that when Diana finally returned, he was slow to accept her presence. Besides his soul-searching, there are also evocative observations of Arctic flora and fauna, including a literally death- defying but liberating encounter with “Nanook,” the gigantic polar bear of the Arctic. A platform on behalf of preserving the Arctic ecology and its Inuit culture, but no pretense regarding scientific or cultural research here. Simon launched this adventure for his own satisfaction, and he achieved that, perhaps on behalf of us all.